Since all of us do not want to get our Wi-Fi passwords hacked, therefore we make them quite complicated. And why not? Why should someone else use our Wi-Fi when we pay for it. However, there are times when you must share your Wi-Fi password with friends or relatives. But what if you forget your password at such times and are left looking like an embarrassed miser to your friend. Now with the evolution of iOS 11 you will not have to face this situation again. 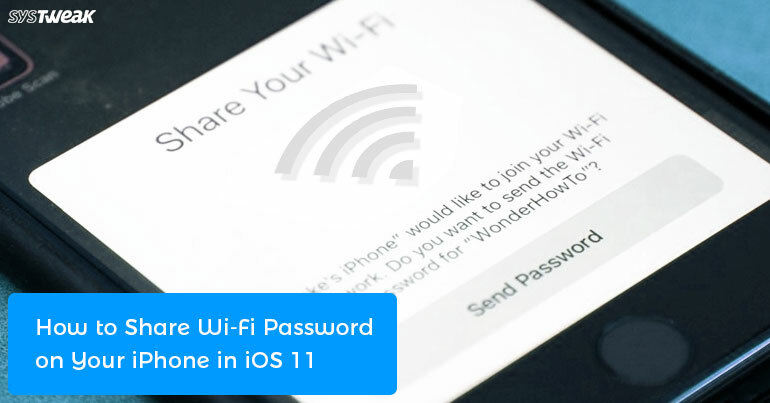 Among all the cool and inciting features, iOS 11 has provided us an all new feature using which sharing our WI-FI password is tremendously easy. So, without further ado let’s find out how to use this feature. To get the things started first enable WIFI and Bluetooth on both the devices i.e. the one which is sharing and the other which is receiver. Tap on Setting app to launch it and then tap on Wi-Fi. Now from all the available list of WI-FI network tap the one which you wish to join. Now hold your iOS device next to the one which contains the password. (Since it uses the Bluetooth to share the password, therefore it is not necessary that both the devices should be in contact with each other). Within a second or two the device with the password will receive a prompt to share the password. Since you wish to share the password tap on Send Password. The moment you tap on Send Password the very same moment it will be shared with the other device. Both the iOS device should have latest version of iOS installed i.e. iOS 11. Bluetooth must be turned on both iOS devices. The user will need to be in your contacts list. Last but not least the device which is sharing the Wi-Fi password needs to be connected to the Wi-Fi network. Undoubtedly this is one of the greatest feature introduced with iOS 11, which can make the sharing of passwords an ease. Now no more remembering or searching those complicated passwords, just a tap and the password will be shared instantly.